Brad Gooch, the author of the acclaimed City Poet, returns with a searing memoir of life in 1980s New York City. Brad Gooch arrived in New York in the 1970s, eager for artistic and personal freedom. Smash Cut is his bold and intimate memoir of this exhilarating time and place, complete with its cast of wild bohemians, celebrities, and budding artists, such as Robert Mapplethorpe, William Burroughs, and Madonna. 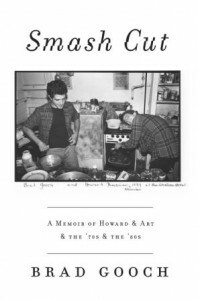 At its center is his love affair with film director Howard Brookner, recreated from fragments of memory and a crosshatch of conflicting emotions, from innocent romance to bleak despair. Brad Gooch is the author of the acclaimed biographies City Poet and Flannery: A Life of Flannery O’Connor, as well as other nonfiction and three novels. 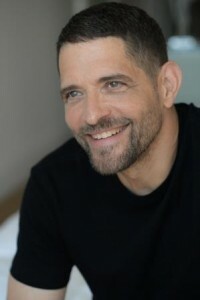 The recipient of National Endowment for the Humanities and Guggenheim fellowships, he earned his Ph.D. at Columbia University and is professor of English at William Paterson University in New Jersey. He lives in New York City. Find out more about Brad at his website. Smash Cut is subtitled, “A Memoir of Howard & Art & the ’70s & the ’80s,” and really that subtitle is both a perfect description, and a string of words that says very little, because while Brad Gooch’s book does cover all of those things, in a delightfully rambling fashion full of celebrity namedropping and lovely (and sometimes poignant) tangential anecdotes, it focuses on the author’s longterm relationship with Howard Brookner. One could even go so far as to call it a love story. It is, however, a love story that feels like a conversation (or several conversations), that explains place and time, lets us glimpse at the culture – general, gay, and celebrity culture – of the decades in question, and drops us into the dawn of the AIDS epidemic in a way only And the Band Played On and The Normal Heart have done before. Gooch’s writing is engaging and honest. His comic timing is perfect, his sense of pathos equally so – as they should be, because he’s relating his own story, through a slightly misty lens. Even though I’m a couple of decades younger than Mr. Gooch, I was familiar with a lot of people he mentioned, so it was interesting seeing them through his eyes, especially as most of them were relatively young at the time. Mentions of the artist Robert Mapplethorpe, in particular, really struck me, because I consider my 21st-birthday visit to his (posthumous) art show one of the final ‘coming of age’ moments of my own life. If I came away from this memoir with any one grain of truth, or piece of insight, it’s the reminder that love is universal, and should be embraced, and enjoyed for as long as possible. You do have to be willing to treat it as though a friend of a friend is telling you their story… a story you may have heard a couple of bits of, but never from the source. A story of fame and art and two really interesting decades of the twentieth century. Goes well with an ’80’s style champagne brunch on the deck. Thursday, April 23rd: Bibliotica – That’s ME!